Next week is the last week of school for my kids and I am trying to gear up for summer. I have to admit that at this point in the calendar, after an intensely packed school year for me and my kids, I just want to sit on the porch, read books and drink lemonade for the next 2 months. Thinking through and trying to create a strategy for managing (and maximizing) long summer days has become an annual ritual of mine. As I looked back at my post this week last year, I saw that I wrote about this AND the Chewy M & M bars that I had just discovered. I can’t tell you how many times I have made them in the past year, since that post! They were on heavy rotation in my kitchen. 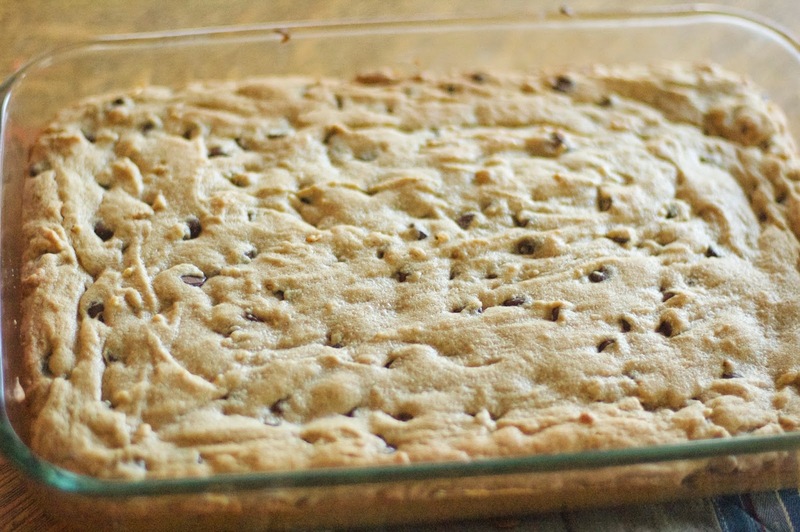 Recently, I have added another bar cookie to my Go-To list. A few weeks ago, I was looking to make an easy but delicious dessert for small group in honor of Caroline’s love of peanut butter and chocolate. I found this one online, and it far exceeded my hopes. 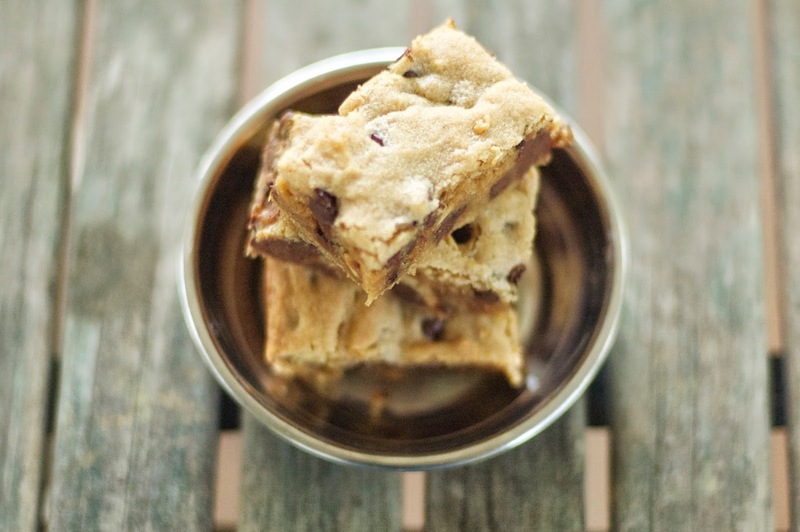 It is gooey, just the right amount of peanut buttery and chocolatey, and is a bar which I love – as it is so easy! It’s made with things I had on hand, and is a cinch to whip up. 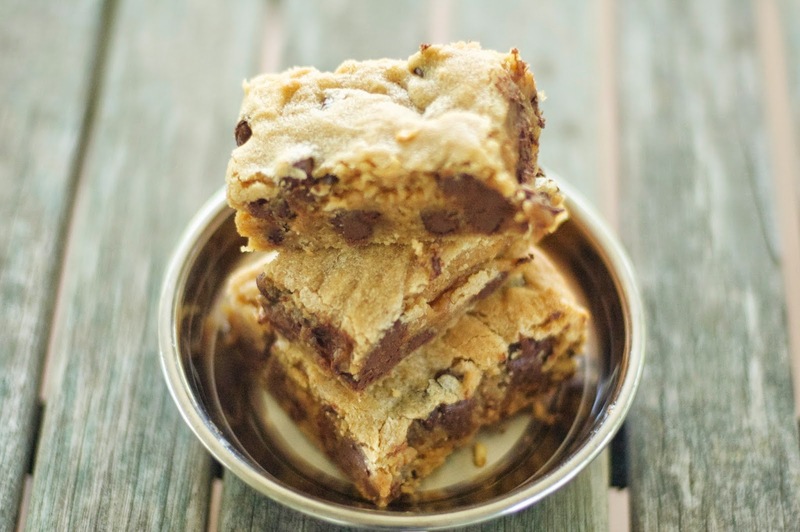 On days when I need to make a treat for a party, or a picnic, or a get together this summer, these Peanut Butter Chocolate Blondies are a good bet. Preheat oven to 350˚. Grease baking pan. 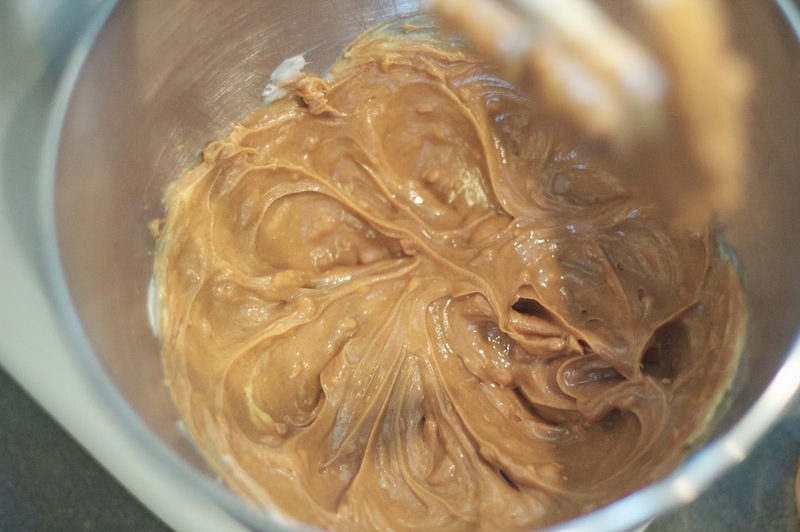 In a medium bowl, cream together peanut butter and softened butter. Bake for 30 minutes in preheated oven, or until the top springs back when touched. Don’t over bake! Of course, feel free to add in other treats- like coconut, or Reese’s pieces, or M & Ms, or nuts into the batter. 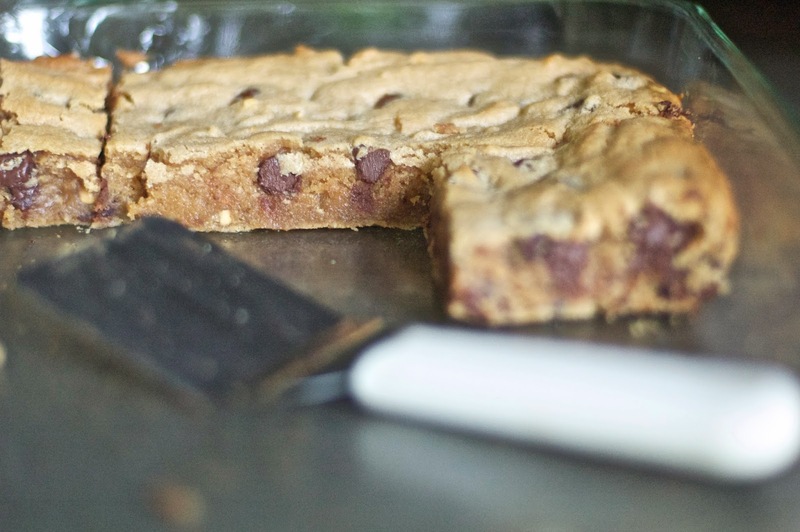 So, in addition to making these bars and eating them, I’m working on a summer strategy for reading, projects, filling our days with productive, seasonal, relaxing and connecting things. I am asking my friends with kids for good ideas to help with this. I used a punch card system last year that worked pretty well for my people. My sister is working on this list of “optional activities” for summer that I am trying to figure out how to best mobilize into action. I’m looking for a “summer central” type of spot in my house to post our plans/ideas/etc. Maybe the laundry room…or clear off the refrigerator and do it there? pick fruit from local farms, just to get started. I have all of these pipe dreams of learning to embroidery, learning how to play Rook as a family, working lots of jigsaw puzzles, doing house projects, and the list goes on. And I have created my annual summer book stack- ones I need and/or want to read this summer. I don’t know how much of a dent I will make on this, but I am sure gonna try. Regardless of how we end up ordering our days this summer, one thing is for sure: things will be busy in the kitchen – with lots of hungry eaters and more time to get creative and try new things! 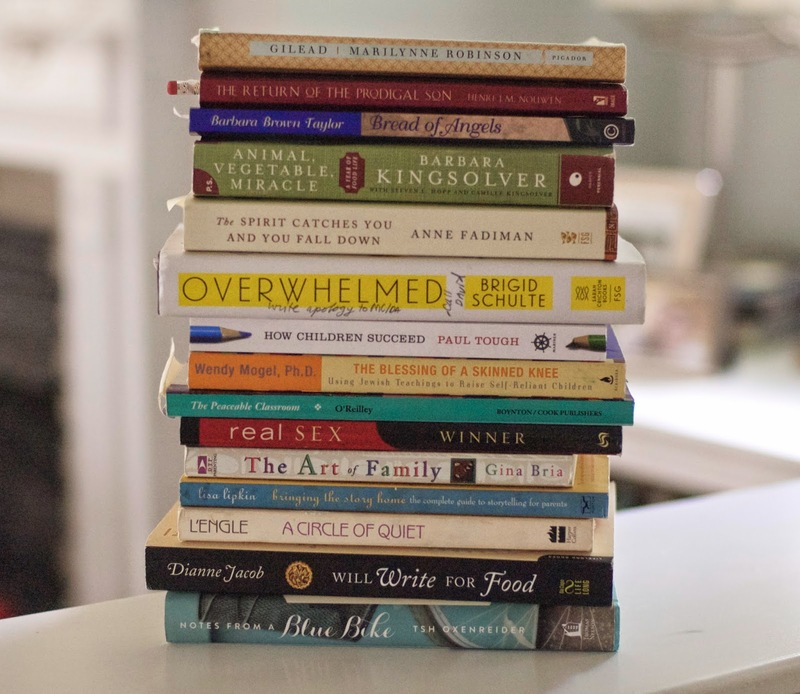 Love your book stack! Animal Vegetable Miracle is one of my favorites. I just finished “Overwhelmed”. SO GOOD. 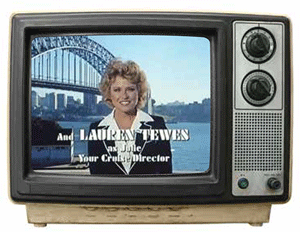 Leigh, It has been on my book list for two years. I just keep it on my “to read” stack! I heard her on NPR and immediately bought the book. I started reading it this spring but had to put it on the shelf while I finished my teaching semester. I can't wait to get back into it. SO INTERESTING and relevant! I love that you read it.